Today we finished our first gamejam. It was the 48 secret’s game jam of 9-10 September. The themes were 2 minute countdown and terminal, the meaning of terminal (a computer, an airport or the last year in french school was up to the participants). 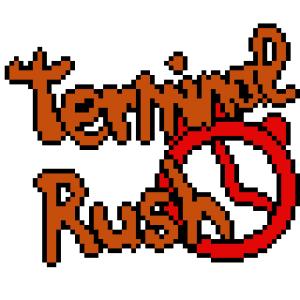 The first draft was a bomb diffusal on a terminal (inside a terminal !) . Nothing too hard, but we wanted to take this opportunity to try exercises ourselves on things we’ll need in our next projects. A guy who’s late to catch his plane and must run through an airport to make it in time. From a top down perspective with dialog and actions. Simple for experimented game developer, but a first for us. If at first we had some doubts about the quality of a project we could do in such short time, or even if it will work, game developer know that finishing a project is a really hard thing to do, the feedback we had was simply awesome. Even though our game is FAR from finished and still bugged to hell, the welcome of the community was great. time managing is evolving with the project, at first we thought « Saturday we make the game and Sunday we perfect it. ». But bumps and code not wanting to work properly can be a huge time consumer and the resting time must be managed accordingly. Code and Asset must be re-usable in a maximum of way,in the rush we tend to forget our best habits.For a project with no real time limit. Thinking about the best way of coding for the project as a whole and the future use of it is relatively natural and easy. But in practice in a short period we tend to add a new script for everything we need, and end up doing a lot of copy-pasting. But if we take a little bit more time to think in a larger picture in the « long » run it’s worth it because the time gain on the whole is greater that the one we gain on making « this new simple script « . It’s not too early to try, we had our doubts but the experience showed us we could participate in a gamjam and even if our game is buggy and not complete it will be accepted as it is. People understand it’s a jam, you’re not supposed to make the next AAA game. It’s like an online game , it doesn’t matter if you are good, what matter is: Did you have fun ? And did you gain experience ? The final point we will make of this whole experience is: you must try challenging yourself and do a game jam. Not only is it fun, but you will also learn a great deal.